Apple’s annual Worldwide Developers Conference, WWDC, officially kicked off on Monday. 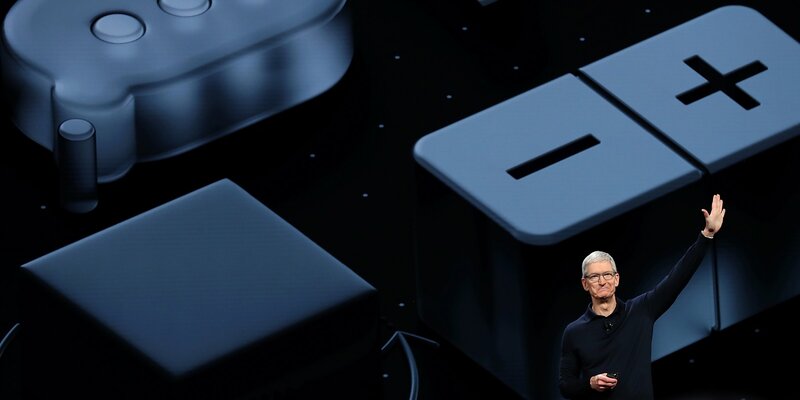 It began with a two-hour presentation from Apple in which top executives took the stage at the San Jose Convention Center in San Jose, California, to showcase the latest developments in iOS, macOS, watchOS, tvOS, Siri, and much more. 1. Good news for owners of older iPhones: iOS 12 will work on any device that supports iOS 11, and it will even give a speed boost to some older devices. Apple says the iPhone 6 Plus, for instance, launches apps up to 40% faster and takes photos up to 70% faster while running iOS 12. 2. Apple teamed up with Pixar to make a new compact file format called USDZ, which is optimized for sharing GIFs and videos that feature 3D graphics and animations. This will be ideal for sharing your augmented-reality experiences with the world. 3. Apple introduced a special new app for iOS 12 called Measure, which, as the name suggests, lets you measure distance and length using only your iPhone. Just tap on your phone and drag a line with your finger to get a measurement. 4. Sharing photos with friends is much easier in iOS 12. If you take photos with friends, iOS can detect who is in them and offer to send those photos to those people. And your friends can get similar notifications to share their photos from the same event so everyone can access the full set. 5. Apple is making Siri much more useful, thanks to Siri Shortcuts, a new feature born from Apple’s acquisition of the excellent Workflow app. With Siri Shortcuts, you can create unique phrases that perform multiple activities in one or several apps. For example, you could create a shortcut for the phrase “I lost my keys,” which could automatically trigger your Tile app to play an alarm so you can find your device. 7. Apple is also updating notifications. In iOS 12, Apple will finally group notifications (!!) by app, topic, or thread. And you’ll also be able to more easily fine-tune which apps can send notifications in the first place. 8. Apple added app limits for people who need help managing their time on their devices — for instance, you could choose to spend only an hour on Instagram a day. Parents can also set limits for their kids; apps can be managed individually or by category, so a child could always have access to the phone app or educational apps, for example. 9. Apple is taking Animoji to the next level with a Bitmoji-esque feature called Memoji, which lets you create a personalized Animoji. You can make your avatar look like the real you or like someone else entirely. 10. Apple’s Messages app will be much more like Snapchat in iOS 12. The camera function in the Messages app will be able to add filters, text, and stickers — you can even apply Animoji and Memoji in your videos. 11. Apple dialed FaceTime up to 11 by supporting up to 32 simultaneous participants. FaceTime is now integrated with Messages so you can go right from a group chat to a group FaceTime, and members can drop in and out at any time. 12. Oh, and the best part about the new FaceTime? You can also apply stickers, filters, Animoji, and Memoji there too — which could result in some horrific team meetings. 13. The Apple Watch is now much smarter about your workouts, thanks to watchOS 5. The new Apple Watch software introduces automatic workout detection, which can suggest an activity based on what it thinks you’re doing (in case you forget to program your workout ahead of time). Similarly, if you forget to turn off your workout manually, the Apple Watch can also now detect if you’ve stopped working out. 14. The Apple Watch has a new way to communicate: walkie-talkie. Just choose a person to talk with, and once that person accepts your request, you two can chat whenever you like — you just push into your watch and start talking. This works over both cellular and WiFi. 16. Students are going to love this one: In watchOS 5, you can add your student ID card to your Apple Watch so you can access your dorm or library, or even pay for snacks or laundry or dinners, with only your Apple Watch. It’ll start at seven universities, including Duke, this fall. 17. The Apple TV is getting a nice new feature called “zero sign-on,” which lets you access all your supported apps included with your TV service on your Apple TV as long as they’re using the same broadband network. That means if you buy a new Apple TV, you won’t have to manually sign into every TV app to start using it. Charter Spectrum will be the first to support zero sign-on, but Apple says it plans to add others. 18. The Mac is finally getting a true dark mode with the newest macOS release, Mojave, coming later this year. The optional dark mode affects the entire system, from Apple’s own apps like Photos and iTunes to all of your windows and filters. It even works in Apple’s programming environment Xcode, which should make coding much easier on the eyes. 19. In the new macOS Mojave, a new feature called “stacks” can easily organize all the random contents on your desktop into neat little batches of documents. If you click on a stack, you’ll see all the contents. And the best part is they stay organized! If you keep adding images to your desktop, macOS Mojave will automatically categorize them. 20. Apple made Continuity, its system that lets you pick up where you left off on other Apple devices, much more powerful in macOS Mojave. Now, if you’re working on a document on your Mac and invoke a function to take a photo, it will automatically activate the camera on your phone. And when you snap that photo, it automatically appears in the document on your Mac. This could be a huge time-saver. 21. Apple also offered a sneak peek of an ambitious project it’s working on: the ability to easily convert iOS apps into Mac apps. Apple used this new tech to bring its Voice Memos, Apple News, and Stocks apps from the iPhone to the iPad and Mac this year, but the new feature will be available for all developers in 2019.